I've always been proud of the values I was raised with. Two of the most important being: a strong work ethic and to treat others with kindness and respect. After University, I moved to Raleigh, NC and I learned a lot about diversity from my first Store Manager at Jeans West in CrabtreeValley Mall, Pat Banks. Years later, in my career at Gap, Inc., I was a part of the Diversity Council. When it comes to my personal values and opinions, my parents, Pat, and my career in retail helped to shape me into the person that I am today. I never thought that I would be writing a blog on this topic, but I have to state my opinion on some of the legislature decisions currently going on in the State of North Carolina. I know that I recently posted on Facebook that all are welcome at Abbington Green: "...In light of the recent legislation that has been passed in the State of North Carolina, we'd like to reiterate that everyone is welcome at Abbington Green". Every day since this decision was passed, major corporations and sponsors have begun to boycott North Carolina. For example, some furniture buyers are boycotting the NC Furniture Expo at the Furniture Mart this year. The Expo is like the "Fashion Week" in New York City for the furniture world. It attracts over 70,000 visitors and buyers, and brings in over $5 billion to the region. Dozens have cancelled their buying trips this year to the Furniture Mart in High Point, NC. Two weeks ago, PayPal announced plans to build a global facility in North Carolina. PayPal has now withdrawn these plans after NC enacted the anti-LGBT Law, HB2. Braeburn Pharmaceuticals has also decided not to build their research facility here. Lionsgate Films and A&E Television have announced that they will no longer film anything in North Carolina, and Fox Television is now stating the same. New York Governor Andrew M. Cuomo has signed an executive order banning all non-essential state travel to North Carolina, and just today Bruce Springsteen cancelled his concert in Greensboro that was to have taken place on Sunday. The list goes on and will undoubtedly get longer. As a result, this law has the potential to be the force that loses North Carolina billions of dollars of Federal funding for roads and schools in the state. The heads of more than 100 companies, including Charlotte-based Bank of America and Raleigh-based software maker Red Hat, are asking the Governor to repeal the law. 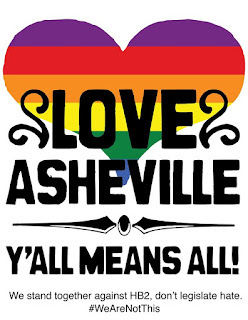 Asheville is known for being a liberal, welcoming, and inclusive place for everyone. That's one of the wonderful things about Asheville, and an important reason that made Steve and I want to move here and purchase Abbington Green. "...Discrimination, in any form, is not acceptable, and it’s bad for business. It’s not acceptable in Asheville. It’s not acceptable in Western North Carolina and it’s not acceptable in our state. Any hint of discrimination should be scrubbed from the law. The very fabric of who we are as a community is tolerant..."
I'm disappointed in this decision made by the Governor, and personally find the discriminatory nature of it unacceptable. As the sign says, Y'all Means All! 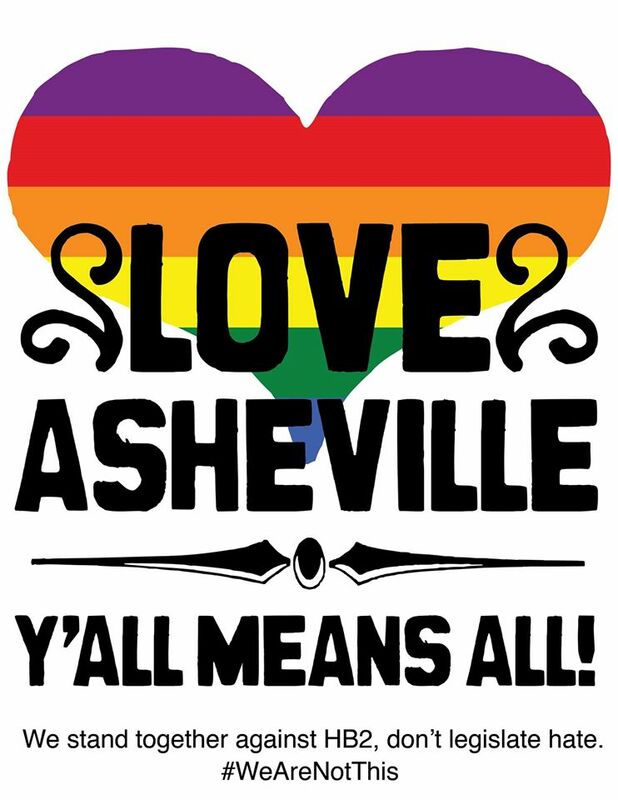 We want you to know that all are welcome in Asheville, and ALL are always welcome at Abbington Green!